Good Thursday to everyone, and welcome into yet another spectacular rendition of the Daily Noontime! Here’s what’s brewing in Boston and New England, enjoy. * The Boston Bruins kicked-off their six-game road trip with a 4-3 shootout win against Montreal on Wednesday, which helped the Black and Gold earn their third win in February. Tyler Seguin was the hero in this particular matchup, as he directed the puck past Carey Price, (31 saves) to help the Bruins earn their final season series victory against the Canadiens. Boston will return to the ice on Friday when they travel to Winnipeg for an 8:00pm face-off. * Detroit handed the Boston Celtics their 13th loss of the season, as the Pistons defeated the Green and White at the TD Garden on Wednesday, 98-88. Rajon Rondo paced the Celtics with 35 points, while Paul Pierce and Ray Allen turned in 10 points a piece. Kevin Garnett did not play due to a hip injury, too. Boston will look to rebound on Thursday when they travel to Chicago to face the Bulls for an 8:00pm tip-off. * In college hoops on Wednesday, New Hampshire edged Boston University’s men’s basketball team, 56-54, while Holy Cross defeated Lafayette, 70-63. * Finally, former Harvard standout and New York Knick, Jeremy Lin helped the Blue and Orange earn their seventh consecutive victory on Wednesday when they defeated Sacramento, 100-85. Lin finished the game with 10 points, 13 assists and five rebounds. Happy Friday the 13th all, and welcome into another tremendous edition of the Daily Noontime! We’re t-minus one-day way from the New England-Denver rematch, and while we count down the hours, minutes and seconds, here are some headlines and news, which will keep you busy. * Jordan Caron and Benoit Pouliot scored both Boston goals, while Tim Thomas recorded 33 saves between the pipes, as the Bruins defeated the Montreal Canadiens on Thursday at the TD Garden, 2-1.The Black and Gold have now won two of their last three contests, and will return to the ice on Saturday evening when they travel to Carolina. * After his team defeated the Canadiens, Tyler Seguin expressed his excitement about being selected to the NHL All-Star game in Ottawa, Ontario. Seguin attended the festivities last year as a rookie, but this year, he’ll suit up with other all-stars. * The Boston Celtics will host the 10-2 Chicago Bulls on Friday, and certainly, the Green and White will look to rebound from their loss on Wednesday against the Dallas Mavericks. * ESPN’s NFL Live predicted the outcome for Saturday’s Broncos-Patriots AFC Divisional clash, and according to former New York Jets and Kansas City Chiefs head coach Herm Edwards, New England will win. Good Thursday morning to all, and welcome into another stupendous edition of the Daily Noontime! Here are some headlines and news to jumpstart your day! * The Boston Celtics came within five points of the defending NBA champion Dallas Mavericks, who defeated the Green and White, 90-85 at the TD Garden. Rajon Rondo paced the Celtics with 24 points, while Kevin Garnett recorded 16 points and 10 rebounds. Boston will return to the hardwood on Friday when they host the Chicago Bulls. * According to ESPNBoston.com – New England Patriots director of personnel Jason Licht is expected to interview for the Chicago Bears general manager position, which is currently vacant. * Montreal will invade the TD Garden on Thursday evening, and despite sitting in 12th place in the Eastern Conference, Boston knows that the Canadiens will be a difficult task. Also, the Bruins announced on Wednesday that Marc Savard would donate a suite for the remainder of the current season, as well as through the completion of the 2013-14 season for Children’s Hospital Boston pediatric patients. * In college basketball last night, UMass defeated Charlotte, 85-75, Boston University overwhelmed Maine, 77-68, Northeastern edged Hofstra, 64-62, and Holy Cross earned their eighth win of the season, as they beat Navy, 73-69. Good Wednesday morning to all, and welcome into yet another tremendous edition of the Daily Noontime! Here are some of the day’s headlines and news, enjoy. * Without left-winger Brad Marchand in the line-up, the Boston Bruins managed to pick up an important win against the Winnipeg Jets on Tuesday evening. 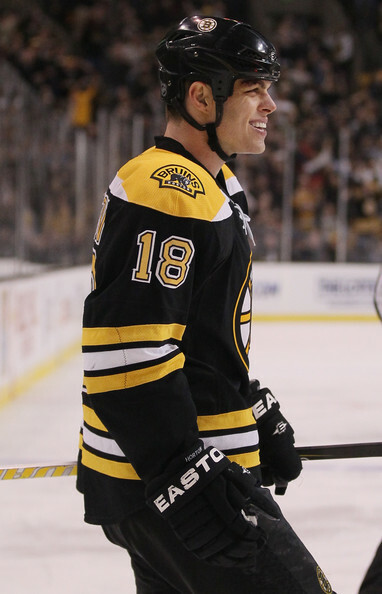 Nathan Horton netted two of the team’s five goals, while Tuukka Rask recorded 29 saves between the pipes. The Bruins will enjoy a day of rest, and then welcome the Montreal Canadiens to the TD Garden on Thursday for a 7:00pm face-off. * According to an article from ESPNBoston.com – Marchand expressed that he wasn’t happy to fork over $152,439.02. He also admitted that he was quite shocked that he was handed a five-game suspension, too. * It’s been a few days since the Boston Celtics last played basketball, but on Wednesday, they’ll host the defending NBA champion Dallas Mavericks, who have won four of their last five contests. The Celtics winning streak was snapped last week when the Indiana Pacers handed them an 87-74 victory. * Despite an interesting 34 minutes, Harvard’s men’s basketball team somehow prevailed, as the Crimson defeated Monmouth, 70-61.